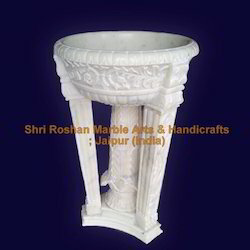 Manufacturer of a wide range of products which include marble big garden planter, marble carving planter, marble planter and white marble carved planter. Accredited for the noteworthy contribution in the market, we offer an extensive range of Marble Big Garden Planter. The given garden planter is crafted from the top grade marble & contemporary tools as per the set trends of market. Offered garden planter is accessible in a number of sizes, finishes and customized options so as to fulfill the needs of customers. This garden planter is checked in terms of quality for ensuring its flawlessness. 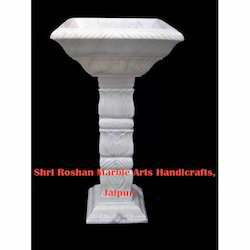 In line with client's diverse requirements across the country, we are offering a commendable range of Marble Carving Planter. This planter is used as a decorative by just filling it with water & putting some flower petals in it. Our planter is provided in numerous customized designs options as per the choice of customers. Also, this planter is made by using best quality marble & advance shaping & cutting tools in accordance with the market trends. Packaging Details: Wooden Crates with foam inside. 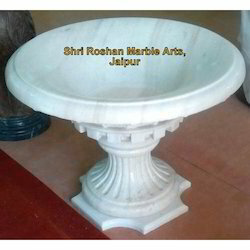 Shri Roshan Marble Arts & Handicrafts is a well known company for it's marble carving work . We offer wide varieties of Marble Planter that may be kept in garden or inside houses to give your plants a safe & best base to grow. This may also be used as a decorative by just filling it with water & putting some flower petals in it. 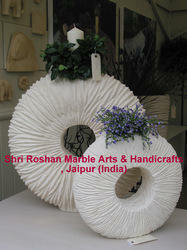 A wonderfull piece of art, this White Marble Carved Planter is carved from a good quality marble stone. Beautiful design gives it a royal look. With the help of our deft professionals, we have been able to offer our clients highly efficient range of Marble Planter. 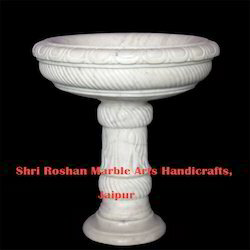 Offered marble planter is available in a variety of sizes and customized options as per the need of customers. This marble planter is crafted from high grade marble & modern tools keeping in mind the market trends. This marble planter is checked on various quality parameters before being dispatched to our customers in order to ensure optimum standards of quality. Looking for Marble Planter ?